Habakkuk was a unique prophet in his own right. Unlike majority of the other prophets, who delivers the word or oracle of God to the people, Habakkuk brings the sorrows of the people to the Lord. He went the other way, his method reversed. The structure of the book is unique, too. It begins with a complaint of Habakkuk, after which the Lord gives an answer. Then Habakkuk starts a second complaint, after which the Lord gives another lengthy answer. The book then ends us with the prayer of Habakkuk. Known for its literary styles, this book is also said to transit us from a sob to a song, as Habakkuk finds assurance in the Lord and gives him the glory for it. In the midst of Habakkuk’s complaints, he questioned the wisdom of God with what he perceived as injustice. In the midst of God’s answers, he proclaimed the depths of his glory. In this study, we will examine the depths of the Lord’s glory in context to the sorrows that Habakkuk found himself in and the injustice that he perceived among the people. the glory of the Lord – how much do you know about the glory of the Lord? I actually doubt I know much about it. Sure, I know our Lord is glorious. But I think I scarcely can imagine the amount of glory he yields. I don’t think I’ll ever truly appreciate how glorious we’re talking about. The glorious of glorious, can you imagine that? A glory far greater than the most glorious king or emperor that ever graced this earth. This is a glory truly deserved, and transcends all other glory – all the glory of his created beings. This is the glory of the Jesus Christ the Son our only saviour and redeemer; this is the glory of his person, as the Son of God, and truly God; similar to the Father’s. This is the glory that all created beings should give to him, for his almightiness and faithfulness makes him glorious. As his people we are expected to constantly give him this glory that he deserves through our faith, our righteousness, our actions; through turning to him, trusting in him and learning more about him. the knowledge of the glory of the Lord – I certainly do not yet truly understand the depths of the glory of the Lord. I do not truly know. But one day we will know – one day all the earth will know the extent of the glory of the Lord. This knowledge of glory will not be mere speculation that’s filled with loopholes, doubts and ‘buts’, as it is now, but this knowledge will be unique and spiritual; an unearthly knowledge, filled with faith and confidence. For the earth will be filled with the knowledge of the glory of the Lord – We see this beginning to happen during the days of the early Church, when the apostles were sent into all the world to preach the gospel of Christ to everybody, and spread the word of God and their testimonies of Christ everywhere – and even till today we see it continuing, for better or for worse, the gospel is still spreading through missions and evangelism. 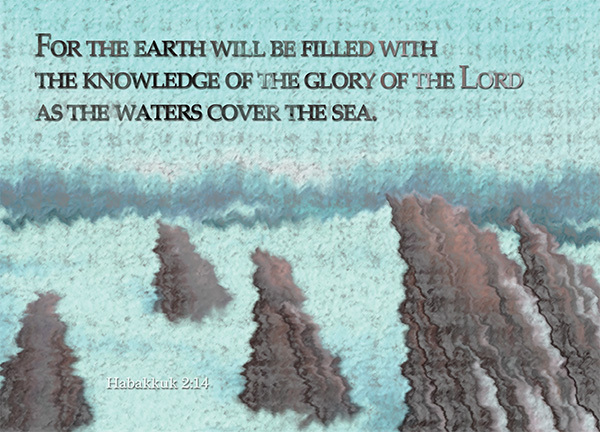 Yet can we claim that the earth is filled with the knowledge of the glory of the Lord? I most certainly do not think so. After all, I do not even dare claim to know the glory of the Lord. I don’t think all who spreads the gospel of Christ truly know the glory of the Lord either. Yet one day we will truly know, and not just us, but all the earth. This is a prophecy that will see its fulfillment at the end of time. This was a prophecy that was proclaimed throughout the Old Testament – Nevertheless, as surely as I live and as surely as the glory of the LORD fills the whole earth [Num 14:21]; All the ends of the earth will remember and turn to the LORD, and all the families of the nations will bow down before him [Psa 22:27]; And the glory of the LORD will be revealed, and all people will see it together [Isa 40:5]; No longer will they teach their neighbor, or say to one another, ‘Know the LORD,’ because they will all know me, from the least of them to the greatest [Jer 31:34]. For the earth will be filled with the knowledge of the glory of the Lord as the waters cover the sea – How do the waters cover the sea? What is the relationship between the waters and the sea? Well, whatever your answer is, that same relationship will be the one that will be shared between the knowledge of the glory of the Lord and the earth. The glory of the Lord will be fully revealed to all the earth, and like the waters, it will be abundantly so, clearly so, refreshingly so, powerfully so. This knowledge will cover us, overwhelm us even, and no-one and no-where will be free from this knowledge. Even the mountains. They will neither harm nor destroy on all my holy mountain, for the earth will be filled with the knowledge of the LORD as the waters cover the sea [Isa 11:9]. Can you imagine how it will be like to truly know the full extent of the glory of the Lord? And more excitingly, it’s not just you who know, everybody you see or hear of will know too. You will no longer be mocked for giving too much glory to your God by non-believers, if you’ll ever be mocked, it must be for not giving enough glory to God. I cannot imagine, and I believe on that day all Christians will look back to our old lives and be horrified at how little glory we give to God. When God said this to Habakkuk in the midst of his moaning, can you imagine what Habakkuk must be thinking? It reminds me a little of the book of Job, where Job complained and cried and complained and cried to the Lord, and when God finally responded, he responded with a whooping 62 questions. We don’t know a lot of things know – but the day when God’s glory will be revealed will come. I love this book. Thanks for sharing.